Valencia CF presidential elections are coming up this summer and current president Manuel Llorente could be on his way out. Right now there is only one challenger for the presidency in the former Valencia CF player and recently former sporting director Fernando Gomez. Many Valencia CF fans, but especially Spanish fans are unhappy with where the club is at right now and understandably so, since the club is about 380 million euros in debt, no trophy has been won since 2007 when the team Managed to win the Copa Del Rey, but that is the season the team barely survived relegation as well, just in the final few matches. The team has been selling its best players like David Villa, David Silva and Juan Mata and Manuel Llorente has been president for the past three and a half years and has presided over what has been happening. Lets start from the beginning. Manuel Llorente had studied economics as a young adult and had found himself working as director for Juan Roig food business Mercadona. The Roig family consists of 5 brothers who are all into business. 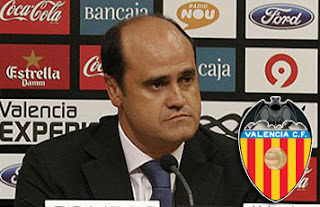 He was doing a great job at Mercadona, so he was given a job at Valencia CF in 1995 as a club manager by Juan's brother Francisco Roig and subsequently became director-general. 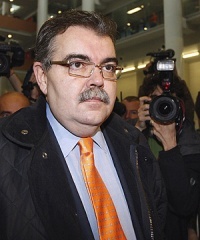 Manuel Llorente was in charge of the finances at Valencia CF from 1999 all the way until 2005 when he was sacked by a board meeting headed by Juan Soler. So Manuel Llorente presided over the best and most successful years of Valencia CF from 1999 to 2004 when the club reached two Champions League finals, won two Spanish titles, Uefa cup, Super cup, Copa Del Rey and more. While things were great sporting wise, the financial situation wasn't booming. Even though Valencia CF had great success, that meant high wages for the players and big bonuses for the officials, putting the club 200 million euros into debt. Even though Manuel Llorente was known for his firmness and tight control of the finances, which actually led to the dismissal of Rafael Benitez as the two were unable to reach an agreement over Benitez salary and the club's transfer budget, the spending was still big and Valencia CF was spending a lot more money than they were taking in and even though the preseason tickets were always sold out and the stadium was full, it just wasn't enough as Valencia CF didn't have the TV revenue or established high paying sponsors. To his defense he wasn't responsible for the transfers and promises made by the presidents at the time and Pablo Aimar's 24 million euros transfer, Gonzalo De los Santos 15 million euros transfer, Salva Ballesta almost 11 million transfer and others were weighing heavily on the budget. Ultimately the club was forced to sell Gazika Mendieta to Lazio for a record fee at that time of 48 million euros. Unfortunately Lazio went bankrupt the next year and so Valencia CF was left without the money and settled for two players Stefano Fiore and Bernardo Corradi. As I already wrote Manuel Llorente was sacked in 2005 by a board decision headed by Juan Soler who had become the major shareholder of Valencia CF and he wanted to have someone closely related who he can trust fully with the finances, so he can do things undisputed. Juan Soler had a good chance to put the finances in order and finish up the stadium, but he had illusions of grander and went on a shopping spree for good and talented, but overpriced players such as Miguel Brito, Asier Del Horno, Joaquin Sanchez, Manuel Fernandes, Nikola Zigic, Ever Banega and others, who not only cost a lot to bring in, but had huge salaries. Joaquin Sanchez for example cost the club a whooping 25 million euros at the time, Manuel Fernandes 16 million, Ever Banega 20 million. Joaquin Sanchez never repeated the performances he did with Real Betis, same with Fernandes and only in the past 2 years has Ever Banega really been performing, though not after a lot of headaches before that and in the midst of it. Step forward, Vicente Soriano, the club’s former vice-president, promising €500 million of new investment from a company called Dalport Investments that would clear the club’s debts and enable them to build the new stadium. It sounded too good to be true – and it was. The mysterious backers, whose company logo was revealed to be copied from a children's coloring book, failed to deliver and Valencia faced a serious liquidity problem. This is when building of the new stadium stopped as the company doing the construction hadn't received one penny for the last year of construction. 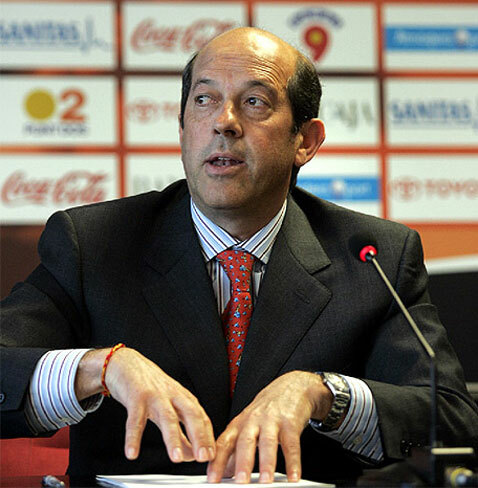 Without going into details there was a huge fight from 2008 till 2009 over the club, in which 3 presidents came and went until Manuel Llorente with his foundation Valencia came in and purchased the majority of shares, then soon after had an increase of the shares of the club in order to gain some capital in order to refinance the debt. Of course all of this was sanctioned by Bancaja which later became Bankia, because Bancaja went bankrupt as well, but merged with Caja Madrid and 5 smaller banks and became Bankia. So officially Manuel Llorente became president of Valencia CF in June of 2009 with a contract until June 2014 and a annual salary of 360.000 euros. At the time Valencia CF had accumulated debt of over 550 million euros, it had an annual loss of over 20 million euros and an interest rate of over 16% on its debt. In other words the situation was terrible, the club might as well have went into bankruptcy and clean the slate, but Bancaja would have lost its money and they were interested to keep the club operating, in order to try and regain their investments/loans in the club, which by then was clear it was obvious loss with little chance of being repaid. Anyways Manuel Llorente did the only thing possible at the time and that is to start selling the club's biggest stars, though not immediately and not before he basically had no choice. He sold Raul Albiol for 16 million euros to Real Madrid, but was determined to keep David Villa and David Silva, even publicly stating they weren't for sale. Whether he was serious and somehow thought he could keep them or if it was just a trick to try and increase their price is unknown, but whatever it was, by the end of 2009 it was clear they would have to be sold in order for the club to survive and not go into bankruptcy, which would have meant the club drops to the lowest league in Spain. In fact 2009 was a year that had the players not receiving salary, payments were constantly late and so in the summer of 2010 David Villa was sold to FC Barcelona for 40 million euros, David Silva to Manchester City for 30 million euros and Nikola Zigic for 10 million euros to Birmingham. Alexis and Carlos Marchena were also sold, but not because their transfers brought any money, but because their salaries were too big. Hugo Viana and Asier Del Horno also left on a free transfer and offloading them meant the club would for the first time in years not have an operating loss and due to the sales it even made small profit. Manuel Llorente had fired sporting director Fernando Gomez in June, appointing Braulio Vazquez as his successor, citing money saving as the reason. Certainly that would have been part of the reason, but I think it was more of an authority move so that he wouldn't have much to contend with with the sale of the biggest players as Braulio Vazquez would have been a yes men and wouldn't have had much say, with the only things concerning the new sporting director would have been to get as much possible for the sales of Valencia's top players. Valencia CF got 80 million from the sale of Villa, Silva and Zigic, but due to the fact that all of the big earners were offloaded it was the equivalent of 100 million profits. Villa, Silva, Del Horno, Hugo Viana, Alexis, Marchena were all earning over 20 million per year combined. That year a lot of the contacts were renegotiated as well and all of the players got a salary reduction. To compensate Manuel Llorente had to put in lower buy-out clauses so that if the players were approached by other clubs they would have easier time leaving. Small portion of the money gotten from the sales of Villa and Silva was spend on bringing in reinforcements such as Roberto Soldado (10 million euros), Tino Costa (6.5 million euros), Mehmet Topal (5 million euros) and others. Obviously Roberto Soldado turned into a huge star and Valencia's key players, but Tino Costa and Mehmet Topal were useful as well, both combined playing key matches and helping lead the team to consecutive 3rd place finishes. Unai Emery was brought in in 2008 and even though in his first season he only managed 6th place with the club, he was kept as manager and that decision paid off as Emery would lead Valencia CF to three consecutive 3rd place finishes that meant Valencia CF automatically qualified for the Champions League and had received some much needed cash. The next year 2011, there was a lot of talk how Juan Mata, who by then became a huge star would be sold, though Llorente came out publicly again and stated that the debt had been reduced by over 150 million euros and there was no need for the club to sell anymore players and as such he would keep Juan Mata. In fact he actually managed to convince Mata to sign a new contract. Came the summer though Chelsea FC came knocking on the door and while Manuel Llorente was serious that he didn't want to sell Mata, Mata wanted to leave and urged Llorente to look at the Chelsea FC offer, so he did and decided to accept their 30 million transfer fee for Juan Mata. The sale of Mata went a long way though of bringing in new players and contrary to popular belief Manuel Llorente spend all of the money from the sale of Juan Mata on new players, bringing in players such as Victor Ruiz, Pablo Piatti, Adil Rami, Daniel Parejo, Diego Alves and even loaned in Sergio Canales for 1.5 million euros from Real Madrid on a 2 year long loan. In fact it is rather miraculous how Manuel Llorente managed to lower the debt by over 150 million euros within just 2 short years, considering the total sale of players such as Villa, Silva and Mata was 100 million euros and the money from Mata's transfer were all reinvested into the purchases of 6 new players. Yeah the team made 20 million profit as well in the two years due to playing in the Champions League, but the fact that he managed to stem the tide when he came in, went through the whole thing of players not getting salaries without loosing even one players for it, to lowering the salary players were earning from 89 million euros in 2008 to 74 million in 2009, 73 million in 2010 and less than 70 million in 2011, all the while bringing in new players, keeping old players and reducing their salary and the club's expenditures at the same time. On December 12th, 2011 it was announced that the club has reached a deal with Bankia to resume construction on the new stadium. The deal was supposed to have Bankia loan Valencia 140 million euros for the completion of the new Mestalla, while Valencia CF gives away the old Mestalla land and new Mestalla land, including the hotel, to the bank and in turn have their 240 million debt to the bank wiped out. Manuel Llorente boasted how the future of Valencia CF was secured and all problems were solved. This year though Bankia unilaterally broke the contract as it was announced that the bank was not solvent and had no money to loan out, and acquiring the stadiums wouldn't have meant anything to them, since they wouldn't have anyone to sell them to and recoup the money. Ultimately the breach by Bankia was good, since the deal was rather bad for Valencia CF and was done in desperation to get rid of the debt and would have meant Valencia CF looses the stadium and ends up having 140 million additional debt to the bank and still paying interest. Basically the deal would have moved the situation further, made it reasonably better and eased up conditions, but it was in no way a great solution. Valencia CF also had trouble finding sponsors for the 2011/12 season and it took Manuel Llorente a lot of travels to try and find one, with Valencia CF playing the first half of the season without a shirt sponsor. Manuel Llorente finally found a sponsor and it was Chinese energy company Jinko Solar. The contract was signed in January of 2012 for the rest of that season. By the end of the 2011/12 season Jinko Solar officials were satisfied with the relationship and the two parties announced a new two year contract that was signed in the summer of 2012. The club also did a promotional tour in the USA at the end of the 2011/12 season, basically instantly after the season finished, and did a promotional tour in Indonesia as well as part of the preseason friendlies. Even more recently, around the time Mario Alvarado was making the waves, supposedly wanting to purchase Valencia CF, Llorente was all over Asia and the middle east trying to find investors and/or sponsors. So we come to the present and what the situation is now, but what has also been achieved in the past. Well what it was achieved is stability, after a large fight in 2008 till 2009 about who will run Valencia CF. Since Manuel Llorente took over the club in 2009 the worst has passed. Due to the increase in shares later that year, the club increased its capital over 92 million euros and that was used to pay off some of the urgent debt and operating fees, so that the club can continue operating normally. Then next year Villa and Silva were sold to net the club a whooping 70 million euros in profits just by those two, but Llorente got rid of some of the high earners as well, reducing the players salary from almost 90 million euros in 2008 to 73 million euros in 2010 and even lower in 2011. The fact that he kept Unai Emery as the coach and negotiated a low salary with him on a yearly contract also led to success as Emery led the club to 3rd position three times in a row, which qualified the team for the Champions League in which it earned 22 million and 16 million euros respectively. So in just two years he lowered the debt by over 150 million euros and Valencia CF actually started making a profit, rather than big losses every year. Since 2011 though the debt has remained at 380 million euros, but the club also hasn't sold anyone, though it could have actually sold Roberto Soldado to Tottenham last summer for 30 million euros, but Llorente decided to keep him and luckily enough Soldado also wanted to stay at Valencia CF, confirming his commitment to retire at Valencia CF, and that has obviously lead to stability this season as Soldado has been the key player for Valencia CF, netting a lot of goals for the team. Now, it hasn't all been great. Under Llorente Valencia CF lost Isco and Jordi Alba, although one could argue that was more of a fault by Braulio Vazquez the sporting director rather than Llorente, though the blame will ultimately reside at Llorente as he is the head of Valencia CF and has the ultimate say. So that is in short the story of current Valencia CF president Manuel Llorente in terms of his history with the club and what exactly has been going on. Hopefully this will make it easier on some to decide whether they support him or not. If you think there is something I should have written and haven't, if you have found some mistake in the article, like mistaken date or just want to share your viewpoint about Manuel Llorente, please do so in the comments.